The first phrase that appears from her radio is that of Paco de Lucía. Still shocked by the news of his death, she does not stop remembering her face-to-face encounters with the artist from Algerice in some past festivals. "He was an endearing person," she says. And it is that throughout her career, María Sarria Gómez , better known as María Pinar, has rubbed shoulders with the stars of music, film and entertainment in general. 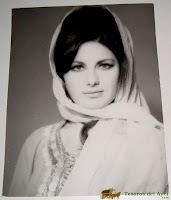 A successful career with a peak moment that catapulted her to fame, back in 1965, when she was chosen Miss Spain. I became the first Triana to win the official title thanks to a maneuver of her sister Encarna. “She sent a picture of me without my knowing it. When I returned from acting in Belgium, I found a letter asking me to send them a full-body photograph. A month later they sent me another letter to go to Serrano Street 103, where the newspaper was published in Spain, but I did not pay attention, I was doing television at that time. And finally they called my neighbor, because I did not have a telephone, and they gave her the news that she had won," says María. Shee then began to prepare the "bathing suits" and attended the cocktail party they organized in her honor in Chicote. "They gave me the prize, a flat in Malaga," she adds. "Then everything was very natural, no silicone," she laughs. She confesses that being elected Miss Spain "helped me but I did not exploit it. They made me many reports”. For decades Maria worked in radio, television, film and theater. Her life has been purely devoted to a profession she has always loved. "They asked me where I worked, and I always answered wherever they hire me. And that my cache depends on the bank's red numbers," she explains. On the street corner of Voluntad Street she is defined as “artist”, it is a term that encompasses everything. She remembers with a certain nostalgia that first performance as a child in the Teatro San Fe María Pinar, competing in the first Miss Spain Triana. "They gave me so much applause that I could not help but cry." Since then, her life has always been linked to the stage. 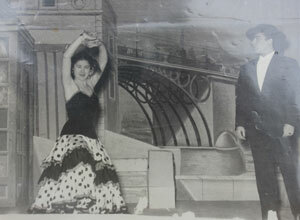 This dancer was trained in large academies, such as Enrique "lame", studied drama with José María de Mena and has played a large repertoire of classics. 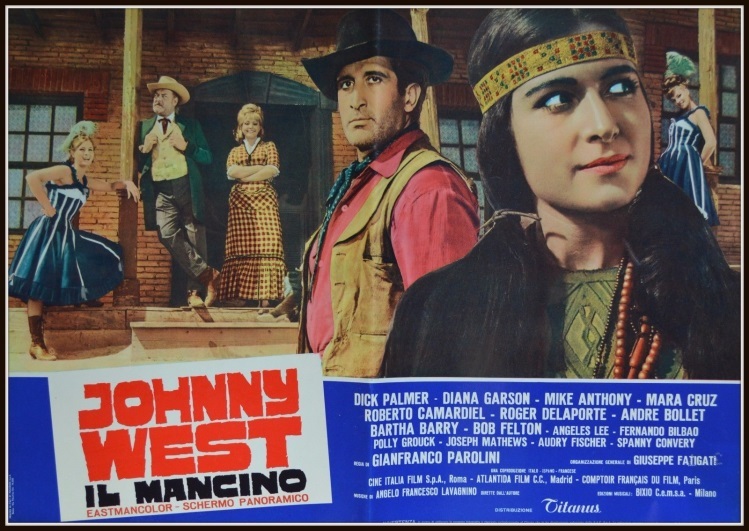 She acted in all the theaters of the city before leaving for Madrid in search of new opportunities because "In Seville there was nothing to do". And there she went with the full anticipation of youth to achieve her dream. "I spent purple, blue and green," she says. Since then, her career was in an unstoppable rise. She filmed more than 15 films, worked at TVE, and always combined all the means of the show. In all areas she moved like a fish in water and the countless early mornings and few hours of sleep did not make a dent in her work. Of course, she does not hesitate to make it clear that she did not like the playful part that the profession entailed. "I did not like to stay up late, and after finishing shows I always went to the hotel." She was married to a creative radio announcer who for years worked with Bobby Deglané . With him she organized a tour throughout Europe to offer shows to Spanish emigrants. "They wanted to give us something and I always asked for a stew," she says smiling. They also carried out innumerable charitable meals for the elderly residents in asylums in Seville. With him she founded a school for announcers after returning from her stay in Madrid, at the end of the ‘70s. María remained linked to the Spanish capital since she continued to do sporadic work there. “The last thing I did a few years ago was on the program of La Banda on Canal Sur, telling Andalusian legends”, an opportunity to ‘relive’ after the death of her husband. This is how Maria was known in her native neighborhood. La Triana who never forgot the one she visits every day from her Mallol Passage. Her mother was from Camas, and her father, from Pelay Correa Street. “He was very well known in the neighborhood, he had a business in the Market, and he was the one who made the Taberna Miami, although he later sold it. He was known as the father of the poor,” She explains proudly of her father, for whom she professes true devotion. ‘The daughter of Joselito’ keeps the thought of going back on a stage. 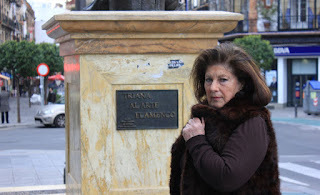 This Triana beauty, which they called "The Giralda with Eyelashes", now prepares a monologue about her life with the writer Pilar Barranco. "I need it psychically, it's my oxygen." Once again, she intends to thrill with her art, this time performing a synthesis exercise to condense in a small dose the extensive and neat work of the versatile artist María Pinar.